In this little corner of Second Life you can explore a street, a bar and a house that have all been build to a real world scale. A lot of places in Second Life have been build to different ideas of scale, often just guesses or estimations based on how large some of the avatars are. By using a realistic scale, things feel more natural. We use the scale of the “prim”, the building blocks of Second Life, translating real world scale straight into Second Life Centimeters. When using the Oculus Rift, realism and realistic scale becomes very important. You will be seeing Second Life trough the eyes of your avatar, while normally you would see the virtual world trough a camera view high above the head of your avatar. This makes visiting a lot of places in SL a strange experience as doors and ceilings appear to be made for giants. 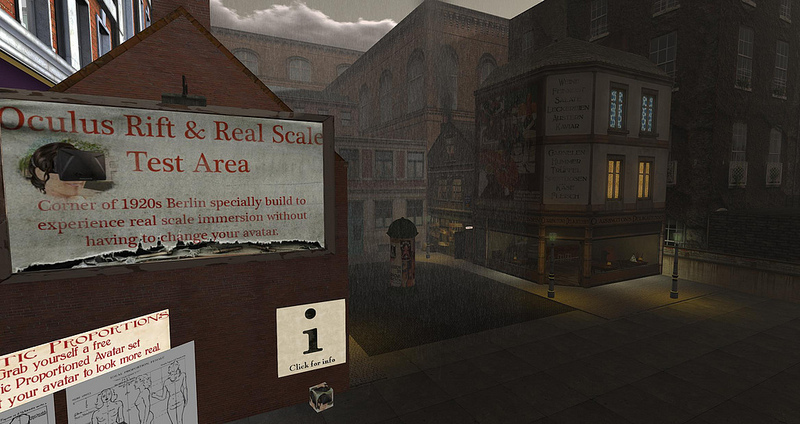 This Test area allows you to see what the use of realistic scale looks and feels like without having to change your avatar or your avatar’s clothes so you can visit the actual 1920s Berlin sim. If you would like to visit an entire city build to this scale and with immersion as one of its main goals, please change into some of the (free) 1920s clothes and get on the train behind the little station. Here you can also get Loki’s mesh Oculus Rift headset for your avatar and the complete building kit for realistic proportional avatars for free. Second Life is Oculus ready! Viewer to be released soon. Nalates Urriah just announced on her blog (click to read the article!) 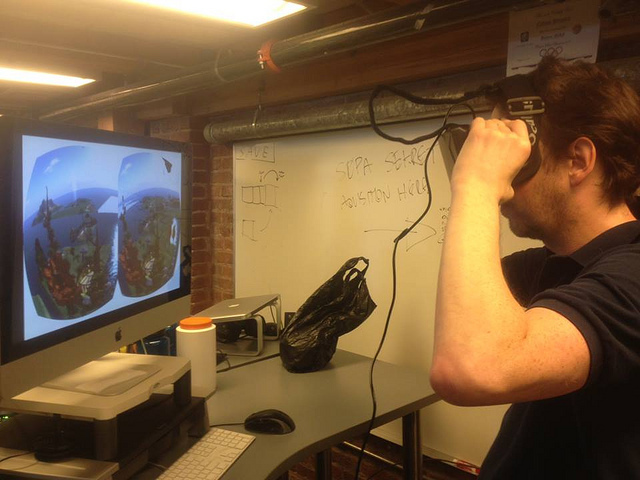 that Linden Lab has finished making a viewer that works with the Oculus Rift! This is very big and exciting news. We knew LL was working on this but all we knew was that it would be finished before the commercial version of the Rift became available to the public next year. Nalates says that VoidPointer Linden said that things looked really cool and that he was actually using it during the meeting. Apparently it had very little effect on his FPS. So we’re not there yet, but I’m still very excited. Things are working and LL is making progress! It has not yet been officially announced when the Oculus Rift compatible viewer becomes available to the public but now it is ready, it seems we won’t have to wait very long. The more time we in SL have to prepare for an Second Life full of Oculus users, the better. Because I think, being very optimistic, that when the Oculus becomes public, lots of people will buy one and after trying a few demos that come with the Oculus, they might want to give Second Life another go. After all, trying a demo is fun, but being able to explore something in VR that you’ve build yourself is even more fun. Of course this all depends on how Linden Lab is going to play this, they have to make sure they are ready to start a whole new PR campaign the second the Oculus goes commercial, making sure everyone who buys one, knows they could (and should) try it in Second Life! Inara Pey was also at the meeting, you can read her report on her blog here. Want to stay up to date with all Oculus Rift in Second Life news? Join us here on the unofficial but approved Facebook page ‘Oculus Rift and Second Life’. CEO of Linden Lab, Rod Humble, trying out the Oculus Rift.